Today is Mike Neir’s 31st birthday – yay! For part of the celebratoriness, I’ve harvested the first of several things from the garden. As I’ve been checking on the cucumbers, I saw ones a few inches long getting started and said, “oh hey, good job!” And then a couple of days later, I pulled back a leaf and found a foot-long monster cuke lurking there. Just in time! The carrots needed thinning, and several of the ones I pulled are large enough to get me a small batch of whiskey-glazed carrots. 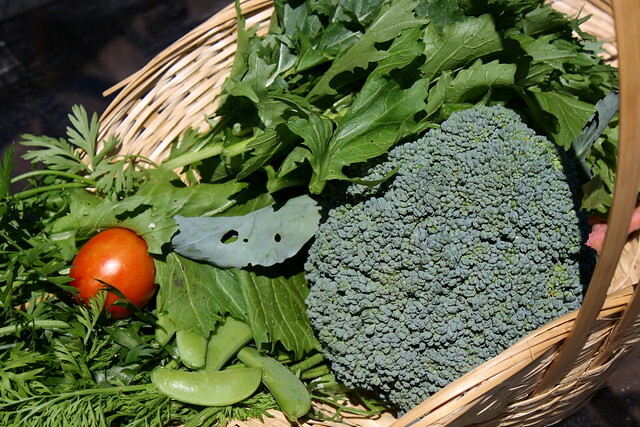 There are mustards to cook or for the salad, peas, a small tomato (which we instantly devoured,) and the first head of broccoli. The red carrots are so pretty – I can’t wait for the purples to come in. 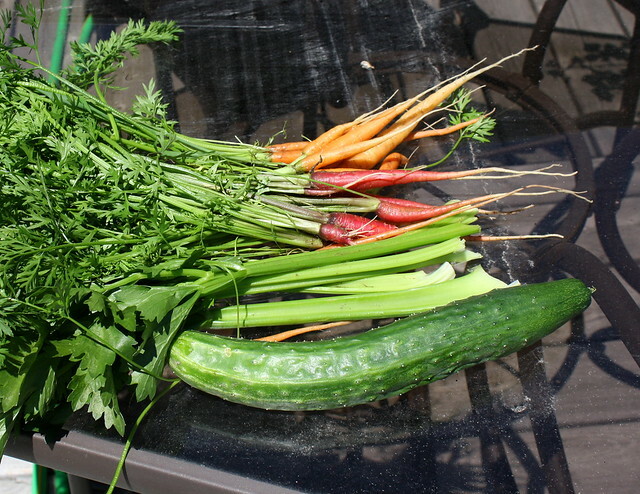 Also – need to plant more carrots. I’m going to try to keep this short, because I have cooking to do, but I do want to say this: I have always known how lucky I am to have found Mike Neir, but as I claw my way out of this toxic state of mind and body, it becomes clearer and more vibrant every day. I can’t imagine a better person to spend my life with! 4 responses to Stuff Just Got Real. Real DELICIOUS. Beautiful! We’re doing it too! Last night was a stir fry using garden veggies: broccoli (side shoots), a few carrots, green pepper, zucchini, the last of the sugar snap peas, and lots of green beans!! Oh yummers, Heather. 🙂 The broccoli plant whose main head we cut is producing a lot of side shoots, happily, and we have another head ready to come off soon. It’ll be awhile before the next batch is ready, though, sadly. A few of my beans just started flowering this week, so beans soon! I wish I’d planted them sooner, darn it.